Costochondritis is an inflammation that occurs in cartilage that attaches to the rib joints. According to MayoClinic.com, costochondritis can produce severe chest pain that can be mistaken for a heart attack. Glucosamine is a chemical that is produced naturally by the body. According to the University of Maryland Medical Center, glucosamine plays an important role in rebuilding cartilage around the joints. Nutritional supplements of glucosamine have become popular recently, being touted as being able to help regeneration of cartilage. Glucosamine is naturally found in the cartilage of joints. According to MayoClinic.com, glucosamine sulfate is part of the glycoaminoglycan compounds that make up the matrix of joint cartilage. Glucosamine sulfate is also found in the synovial fluid that surrounds all joints. Studies have shown that the sulfate component of glucosamine is responsible for strengthening cartilage. Glucosamine supplements have shown the most promise in the treatment of osteoarthritis of the knee, but some feel it may have some benefit in the treatment of costochondritis. Costochondritis causes pain in the front of the chest where the ribs attach to the breastbone, or sternum, according to the University of Iowa. The exact cause of costochondritis is unknown, but it often follows an injury to the chest or a respiratory infection. Costochondritis has also been associated with fibromyalgia and performing repetitive motions with the upper body. The chest pain typically worsens when taking a deep breath, and there may be tenderness around the rib joints when pushed on. The most common treatment for costochondritis is taking an NSAID, or non-steroidal anti-inflammatory drug, such as ibuprofen. As an alternative treatment, HealthLine says taking a glucosamine chondroitin supplement may help heal the cartilage. According to MayoClinic.com, studies have shown encouraging results that glucosamine may be beneficial for use in osteoarthritis of the knee, but reports have been conflicting about its effectiveness in treating other conditions. Glucosamine supplements have not been reviewed by the FDA for effectiveness, purity or safety, so glucosamine should not be added as a supplement without consulting a physician. Glucosamine supplements should not be taken along with NSAIDs. 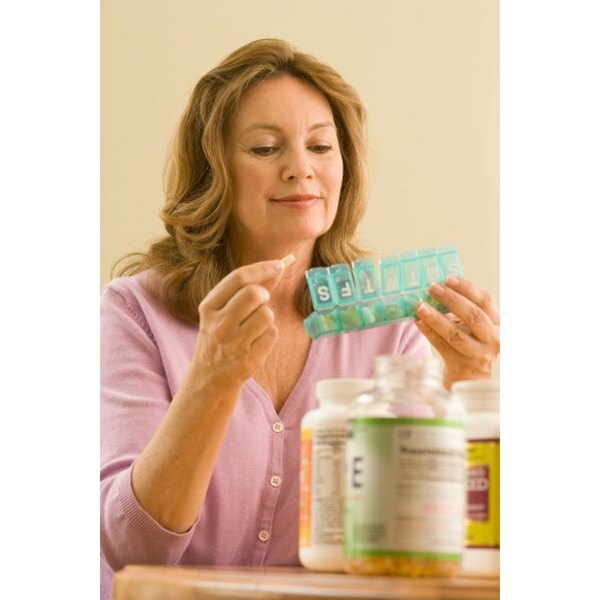 According to MedlinePlus, glucosamine supplements are typically safe for most to take under a physician's advisement. Side effects tend to be mild; the most common ones include nausea, diarrhea, heartburn and constipation. The less common side effects of glucosamine include skin rash, headaches and drowsiness. According to the University of Maryland Medical Center, some forms of glucosamine supplement contain chitin, a substance obtained from shellfish, and cannot be taken by those allergic to shellfish. The symptoms of a severe allergic reaction include hives, difficulty breathing and swelling of the mouth and throat. Those who are pregnant or breastfeeding should not take glucosamine. Glucosamine can interact with insulin and NSAIDs, and their dosages may need to be adjusted by a physician. Those with asthma should consult a physician before taking glucosamine. Is Glucosamine Better Absorbed Through Liquid or Capsule?